Congresswoman Lucille Roybal-Allard once again recognized student artist in her district, announcing the winners of her annual art competition. Rebeka Martinez, a senior at Paramount High School, was the first place winner of the 24th Annual Lucille Roybal-Allard Student Art Competition for her piece “Light That Never Goes Out.” She will receive a $1,000 scholarship, $200 for art supplies, and a trip with a parent to Washington, DC to attend the national art exhibit opening. Rebeka will have her entry displayed in the U.S. Capitol for one year, while the remaining winning students each received a scholarship, money for art supplies and will have their artwork displayed in Congresswoman Roybal-Allard’s District Office in Commerce. 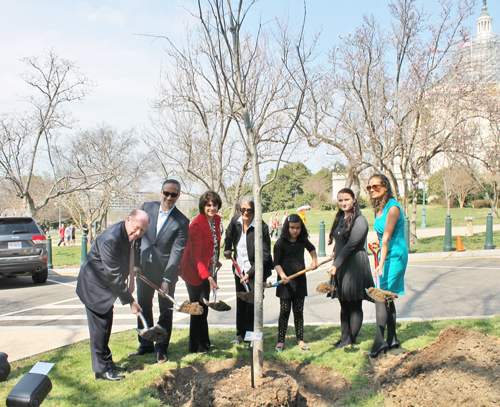 “Once again, the students in this competition have displayed their great artistic talents by producing a range of striking and memorable works,” said Congresswoman Roybal-Allard. It’s an American tradition, the presidential pardon of a turkey during the Thanksgiving season. Scheduled to take place Wednesday in the White House Rose Garden, the pardon allows the turkey to continue to live free. At a news conference last Thursday, three Democratic House members urged President Barack to exercise the same compassion and constitutional authority to pardon 750,000 “Dreamers” before he leaves office. Reps. Roybal-Allard (CA-40). Zoe Lofgren (CA-19) and Luis V. Gutierrez (IL-4) asked the commander-in-chief to protect undocumented young people brought to the United States as children, who signed up for his DACA (Deferred Action for Childhood Arrivals) program. Fearing that President-elect Donald Trump will repeal DACA once in office, the Democratic leaders want to ensure the three-quarters of a million young people commonly referred to as ‘dreamers” are protected from deportation. “By no fault of their own, these Americans are prisoners in their own country, living their daily lives not knowing if they will be deported to a foreign country,” Roybal-Allard said Thursday at the U.S. Capitol. President Obama issued the executive order creating DACA in June 2012 to protect young people from deportation who were brought to the country illegally through no fault of their own by a parent or other guardian. At the time, Obama said the young undocumented immigrants are “Americans in their heart” but not “on paper,” acknowledging the fact that many of those eligible for DACA have spent most of their lives in the U.S. and have no real ties to the country where they were born. 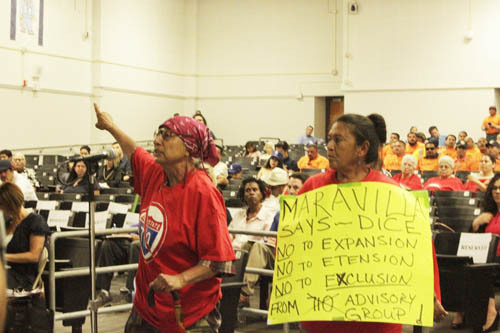 Fear is growing among undocumented residents that Trump could be getting ready to act on a campaign promise to deport 2 to 3 million people in the U.S. illegally with criminal backgrounds, and to reverse Obama’s executive actions creating DACA. Under DACA, three-quarters of a million immigrants without legal status have become eligible to receive a temporary, two-year renewable permit to work legally in the U.S., get a Social Security number, pay taxes and to get driver’s licenses, in addition to a reprieve from deportation. To qualify, applicants must have been brought to the U.S. as children or teenagers, be under the age of 31, been in the country for at least five years, be pursuing an education or have already received a high school diploma or its equivalent. Those who registered under the DACA initiative paid a fee, were fingerprinted, provided addresses of relatives and had to pass a criminal background check, which means the Department of Homeland Security could easily locate them if they were to become subject to deportation under the Trump Administration, the elected officials pointed out in a letter addressed to the president. “Using your pardon authority, which is not subject to reversal, to protect young people who relied on the program you implemented is quite literally a matter of life and death,” the letter reads. President Obama has not responded to the request directly but the White House reiterated the president takes the executive clemency power seriously and explained that his pardon could provide legal status to the undocumented individual, which DACA does not grant. “As we have repeatedly said for years, only Congress can create legal status for undocumented individuals,” a White House official was quoted as saying. The three members of congress point out that power to grant reprieves and pardons extends to civil immigration violations. “We trust that you will consider our request with the utmost urgency given the gravity of the situation and hope that these pardons could be accomplished this Thanksgiving season,” the letter concluded. 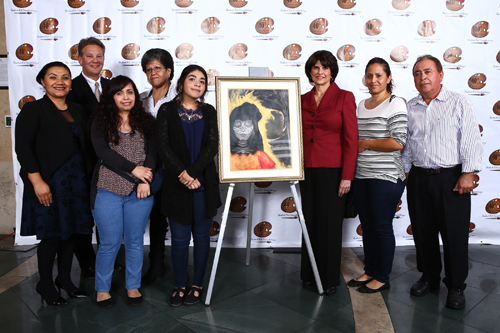 Congresswoman Lucille Roybal-Allard honored five young female artists this week during her 22nd Annual Student Art Competition. The winners received scholarships and money for art supplies. The first place winner Justine Muñoz will have her artwork displayed in the U.S. Capitol. All submitted entries will be on display to the public through June 5 in the lobby of the Citadel Outlets in Commerce. 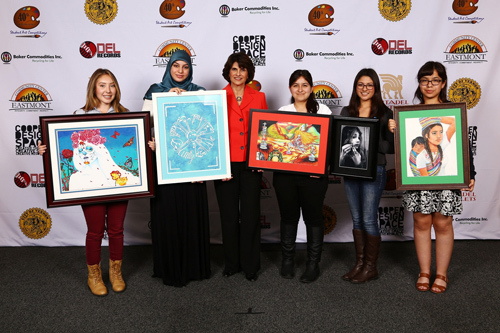 Pictured: (Left to right) 1st Place winner Justine Muñoz, People’s Choice Award winner Batoul Akil, Congresswoman Roybal-Allard, 3rd Place winner Lelilani Gonzalez, 2nd Place winner Sabrina Claros, and Honorable Mention winner Karla Maria Jacome.